Furthermore, on 19 July, Dr. Seiple spoke at the Diplomatic Academy of Vietnam (DAV) in Hanoi on religion and U.S. foreign affairs. Attendees included government officials and researchers who work on foreign affairs and religion-related matters. Currently, the Vietnamese government is working on drafting new laws on religion. Through its ongoing partnership, IGE, Brigham Young University, and the University of Social Sciences and Humanities-Hanoi will deepen and expand its R&ROL training program at the national and provincial levels to support this effort in 2014-2016. The training will include comparative studies about law on religion, policymaking, and religious freedom. In addition, there will be academic exchanges of professors from Vietnam and the United States. The training will help provide more knowledge and resources on international standards of policymaking and laws on religion for Vietnamese government officials and policymakers. 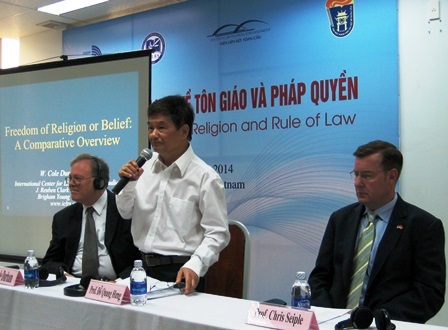 Through 10+ years of trusted partnership, IGE and its partners in Vietnam are working on a concept paper to explore and implement new initiatives on religious freedom in Vietnam over the next five years. They will also develop joint activities to celebrate the 20th anniversary of Vietnam-United States normalization in 2015.